Uhhhhhh… I think I just found my favourite biscuit EVER. These are so beautiful. 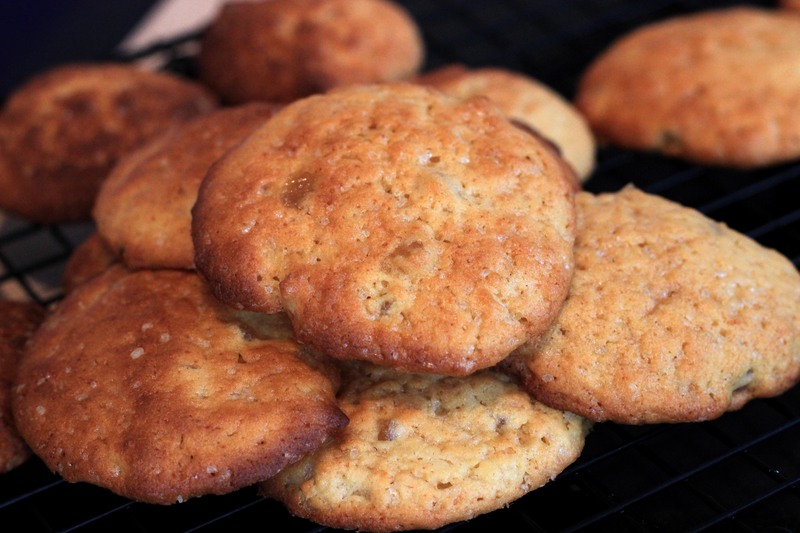 If you like ginger biscuits, these are even better. The hint of lemon is just wonderful, and it works really well. I’ve been drinking a lot of herbal tea recently, and when I was feeling a little under the weather the other week I bought some ginger and lemon tea (best mixed with honey). It made me feel so much better – pretty powerful flavour! But then I was flicking through my recipe books looking for Christmas ideas, and these stood out. I figured it was worth a try, and that ginger and lemon might be nicer together when mixed with sugar and flour and golden syrup instead of hot water. I was not wrong. The original recipe says to use freshly grated ginger instead of ground ginger, but I found the crystallised ginger to be so strong that I thought having fresh ginger on top of that would be too overpowering (it also meant I didn’t have to try and find ginger root from somewhere). If you’re not a huge fan of ginger, then I think these can probably be adapted to be lemon and honey biscuits instead (another great tea). Swap the golden syrup for honey, and the crystallised ginger for candied peel, and either leave out the ground ginger or swap it for vanilla extract or something. I’m hoping to try this next week. Also, a lot of biscuit recipes say you should refrigerate the dough for a while, and usually I don’t bother, but in this case the dough is really soft, so that time in the fridge is pretty important. I think I will be making many a batch of these in the run up to Christmas…and I’ll have to try not to eat them all myself. 1. Cream the butter and sugar together until pale and fluffy. Mix the egg, golden syrup, ginger, lemon zest and juice together in another bowl and the flour and baking powder together in a third bowl. 2. Alternate between adding wet and dry ingredients to the butter mixture, mixing as you go until it starts to form a dough. Refrigerate the dough for 1-2hrs. 3. Preheat oven to 190C/Gas 5 and line two baking sheets with greaseproof paper. Using a teaspoon, place small lumps of mixture on the sheets, leaving about 4-5cm between each one. Bake for 8-10 mins until golden, and allow to cool on a wire rack.